The Robada Intersection in southern Tierra Robada. The Robada Intersection is a major highway intersection connecting Garver Bridge with the highway running through Tierra Robada, servicing Las Venturas and Bayside. It is located at the southern tip of Tierra Robada, immediately west of southern Bone County. 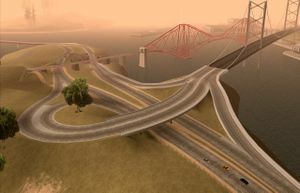 The Robada Intersection is not registered on the San Andreas map in the game box. This page was last modified on 23 February 2012, at 22:40.